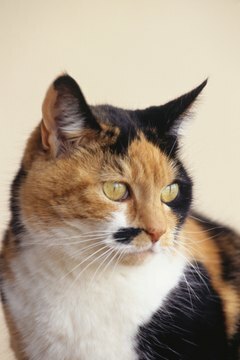 The Companion Animal Parasite Council recommends bathing giardia-infected cats with shampoo to remove associated cysts. If Princess picked up giardia, don't be alarmed; with treatment, she'll recover just fine. Metronidazole and fenbendazole are effective in treating the parasite, but the drug sulfasalazine isn't helpful. Thoroughly cleaning her living and sleeping areas with disinfectant will minimize the chance she picks up this beastie again. If Princess has giardia, she's hosting teeny one-celled organisms in her small intestine. If she was outside taking a sip of water from an infected spot, or if she dug around in an area where an infected cat pooed, she unknowingly has come in contact with this unwelcome stranger. Though it's uncommon for cats to be infected with this parasite, when infection occurs, it tends to happen in multiple-cat homes or in catteries because of its method of transmission. According to Cornell University's College of Veterinary Medicine website, cats probably need to be exposed to the parasite several times before they're actually infected. A cat infected with giardia can suddenly come down with a nasty type of diarrhea that's particularly stinky. It also have an excessive amount of mucus or be frothy- or greasy-looking, but not necessarily. Depending on how often Princess suffers from this unpleasant business, she may also lose weight. Some cats develop fever and become lethargic. A stool sample will confirm if Princess is living with these guys. If so, several treatment options exist. Among them, metronidazole is the drug most commonly prescribed. Metronidazole is an antidiarrheal medication used to treat inflammation of the large intestine. It's effective against the giardia parasite, as well as against other protozoal and bacterial infections. Giardia can be anaerobic, meaning it can grow without oxygen; and metronidazole is able to inhibit growth in anaerobic conditions. If Princess has been confirmed to have giardia and is taking metronidazole to kill the parasite, she may experience side effects, such as drooling or gagging, regurgitation or vomiting, loss of appetite, lethargy and diarrhea. She may also experience an allergic reaction, such as hives, or dark urine. Kittens and pregnant or lactating queens shouldn't take this medication, and cats with kidney or liver disease should take it with caution. Though sulfasalazine is used to treat digestive and intestinal disorders in cats, it's not used to kill giardia. Instead, sulfasalazine is used to treat conditions such as colitis, an inflammation of the large intestine. This medication is a combination of a sulfa antibiotic and aspirin, which helps soothe the inflamed colon. Though sulfasalazine isn't used for giardia, metronidazole is a treatment option for colitis, since it addresses inflammation of the large intestine. According to the Companion Animal Parasite Council, fenbendazole, also known as Panacur, is another option for getting rid of Princess's rude visitor. This drug decreases the parasites' energy reserves and limits their ability to eliminate waste and protect themselves. Sometimes vets will prescribe a combination of fenbendazole and metronidazole to work together to treat a cat's giardia infection. Fenbendazole's potential side effects include diarrhea, lethargy and loss of appetite.